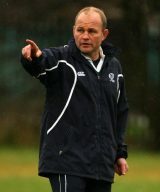 Andy Robinson is a former England openside flanker who has since carved out a coaching career which included spells in charge of both England and Scotland, both of which ended in his resignation. Robinson club career was spent at Bath during which time he won eight England caps. Seven came in a nine month period in 1988-89 and his final outing was when he was recalled for the defeat against South Africa in 1995. He also represented the British & Irish Lions on the tour of Australia in 1989 but did not play a Test match. After retiring he coached Bath and became the England forwards coach as well as being a part of the coaching staff on the Lions tour of Australia in 2001 and New Zealand four years later. He was Clive Woodward's right-hand man when England won the World Cup in 2003 and once Woodward stepped down a year later, Robinson took over. He struggled to get to grips with the off-field politics as much as the on-field requirements and after only nine wins in two years he stood down, blaming the Rugby Football Union's lack of support for his departure. He moved north of the border a year later and enjoyed two successful seasons with Edinburgh before he was appointed the new Scotland coach. But his side finished bottom in the 2010 and 2011 Six Nations although there were some highlights including the 2011 victory over South Africa at Murrayfield. A poor World Cup in 2011 was followed by a dismal Six Nations with the nadir a home loss to Italy which even a shock win in Australia in the summer could not paper over. Another humiliation at Murrayfield - this time by Tonga - made his position untenable and he again quit. He was not out of work long and was soon appointed Bristol's director of rugby.